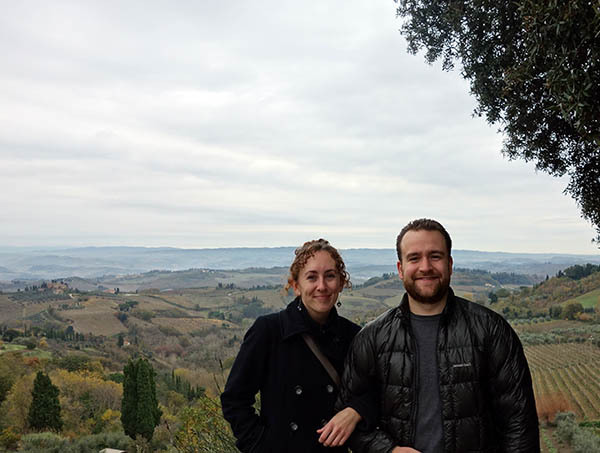 Our stay in Florence was interrupted by a full-day tour in Tuscany. This was one of three tours we took (the other two were 2-3 hour tours of the Colosseum and Vatican Catacombs). 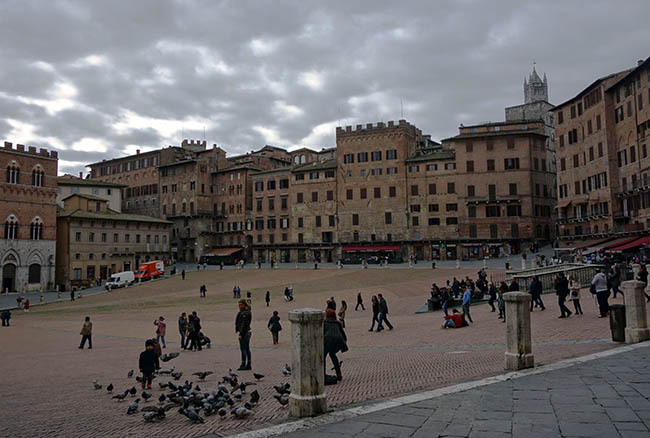 The day would be packed – in the end, a bit too packed – and the agenda included Siena, San Gimignano, a wine tasting & lunch, and a visit to Pisa. While none of these places were far from each other, about half the day was spent on the bus. The tour started with some bad luck: this was a relatively rainy day, drizzling off and on for the duration. Luckily, we weren’t hit with too much rain while outside (the worst of it was in Pisa at night, and even then it didn’t pour). 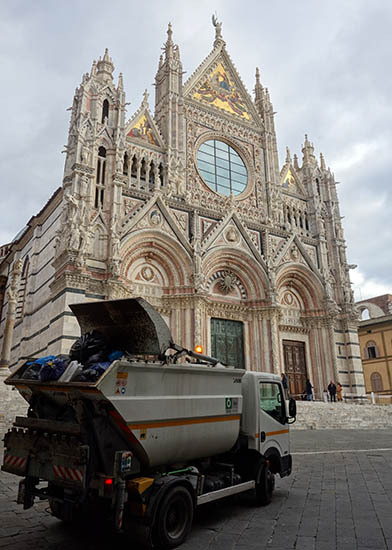 Our first stop was Siena. Most famous as a color (Burnt Sienna), Siena is a small medieval town known for its hilly streets and the Piazza del Campo. Recently, it’s become more of a tourist location, but it still retains some of its charm. We got a tour from a local guide, saw the world’s oldest bank, and stopped by the Piazza. This square, smaller than pictures would make it seem, is filled with crowds twice a year. The borders are covered with sand, stands are built, and each district of the city is represented by a horse and rider. The horses are chosen by lottery, so the results tend to be relatively random. The districts are represented by rabbits, lions, geese, and other animals, and the race can be total chaos. We didn’t get to see a race, which was a shame. But, if we return to Italy in the future, Siena is somewhere I’d love to spend more time. For me the highlight of the visit was the Siena Cathedral. There was a religious service going on that day, but we were allowed in on the condition that we didn’t talk or take photos. I would say this was my favorite cathedral in all of Italy – it was so distinctive. Most notably for the amazing mosaics that cover its floors. The interior of the cathedral is also done in the Pisan style, with striking black-and-white patterned columns and walls. I wish we could have spent more time inside – and also taken photos! After this, our tour ended and we took a brief walk around the city on our own. Although touristy, this was the off-season, and even a block from the main attractions, stores were filled with locals. Overall we really enjoyed the city (it was my third-favorite in Italy), but we had to move on to the next destination, a winery. 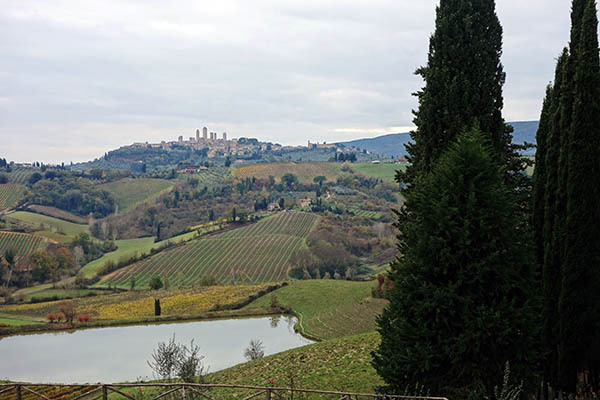 This winery served organic, locally-grown food alongside the wine, and was located in the countryside near San Gimignano. The wine – 4 bottles – was given to groups of 4 people. We shared ours with two tourists from Vancouver, Canada. It was all-you-could drink, and we drank a lot… I think the food was pretty good, too. But I don’t remember too much! San Gimignano was the next stop, and I was definitely still enjoying the wine… San Gimignano is one of the few hill-towns in Tuscany that retains its towers. These hill-towns were numerous during the middle ages and renaissance, and each town was filled with towers used by feuding nobles. Although the towers remain, the rest of the town has been utterly commercialized. It really is a small town (7k people), and just about all the shops sell tourist trinkets and memorabilia. I don’t think there’s any culture left. About the most interesting thing we saw here, from a nice vantage point over Tuscany (we were on a hill, after all), was a guy playing didgeroo in the rain, in the nearby park. 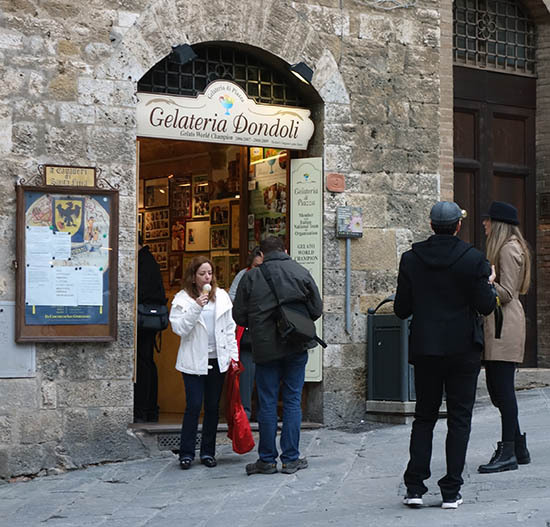 San Gimignano is also home to what is reputed to be the “world’s best gelato.” It has some legitimacy, because the owner of the shop won a World Cup of Gelato with the Italian national team. But then, I’d assume Italians would win such a cup – wouldn’t you? And I think the other Italians who participated would also own shops, so who can say which is best? Nonetheless, it was good stuff. 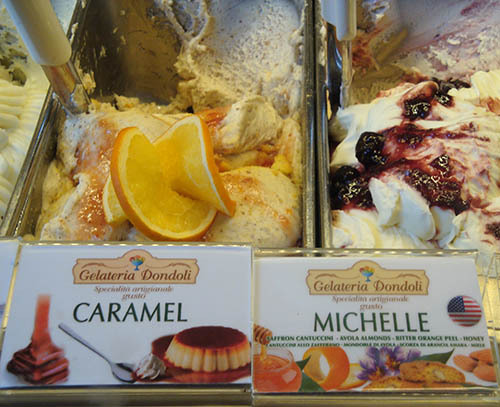 The Obamas had visited the town earlier in the year, and they’d created a flavor specially for Michelle Obama, which Alex ordered and enjoyed (I think it was hazelnut orange). It was her favorite gelato on the trip. The final stop of the day was in Pisa. 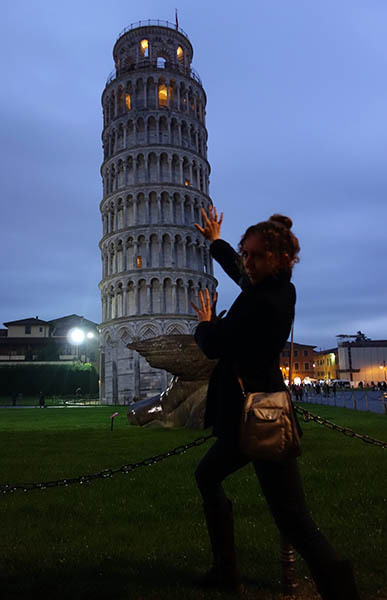 It was really raining now, and we wandered around the leaning tower, which sits in a big field of other monuments, and took a small ‘train’ tour of the city. We didn’t get a good view, but it’s mostly a university town and wasn’t super-exciting for us. Nice to say we’ve been, but I think the 2 hours were enough. 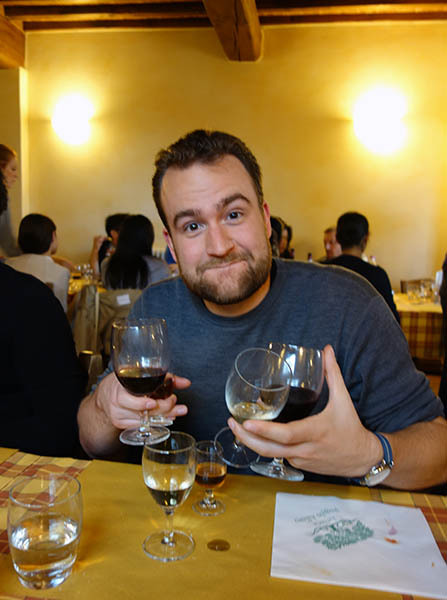 Overall I enjoyed the tour, and the highlights were Siena and the wine – but I probably would have enjoyed spending 2 days in Siena and skipping the rest. 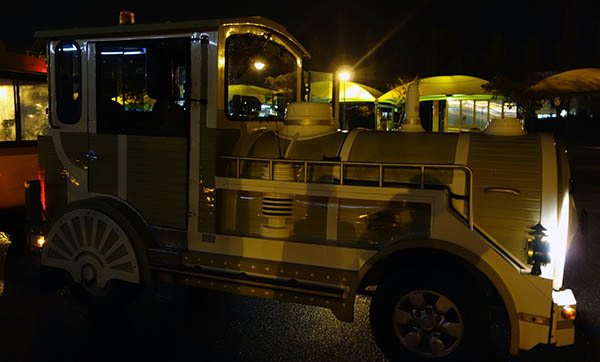 Given our tight schedule, however, it was a good options, we met some nice people, and had some good tour guides. Finally, we returned to the Florence train station. 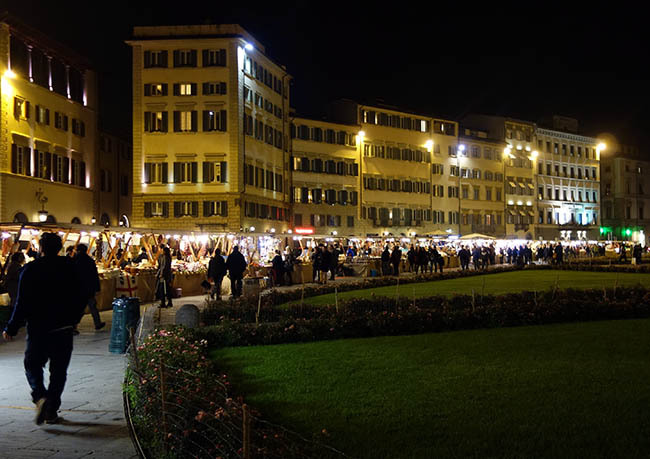 There was a farmers/craft market going on, and we sampled some snacks, but mostly we were full and tired (the lack of sleep in our noisy apartment was catching up to us – or me at least), so we returned to our apartment for the last night in Florence. On the following day we’d head to Lucca, my favorite city of the trip. This entry was posted in Italy on January 21, 2015 by rob.